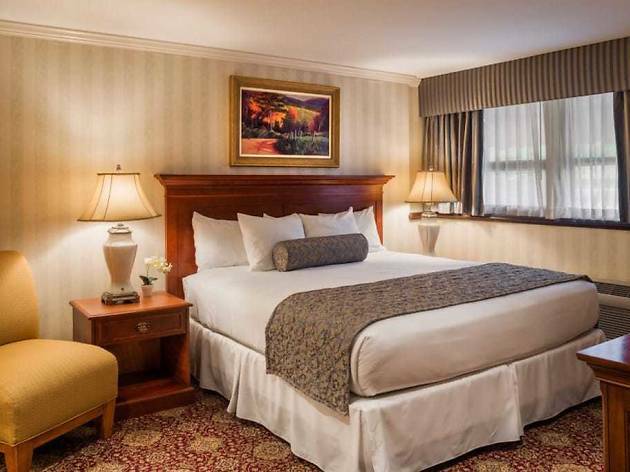 Book a stay near Philadelphia in the heart of the tony Main Line, perfect for those visiting students at nearby Villanova. This hotel is perched within a lush garden that’s ideal for weddings, but you don’t have to be tying the knot to enjoy them. Most of the quaint, compact rooms face the pretty garden space, so you can stretch out on your plush-top mattress and enjoy the view—or, on nice days, get out to take a stroll. 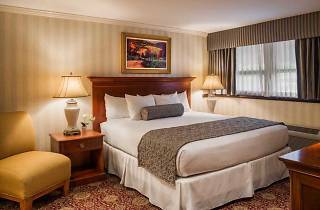 You can choose from a king and double guest rooms or luxury suites, which, grant you basic in-room amenities, such as flat-screen cable TVs, free high-speed Wi-Fi and extra seating areas in the larger rooms. A restaurant onsite, Glenmorgan Bar & Grill, serves contemporary American fare, but most guests rave about the Sunday champagne brunch, which features a buffet stocked to the gills with breakfast fare such as eggs, bacon, corned beef hash and fresh baked fish. Diners get the extra treat of a live classical pianist twinking the keys as enjoy their meals.